I started this cape project earlier this year, it’s a flow on from my big ‘separates sewing’ days from 2014. 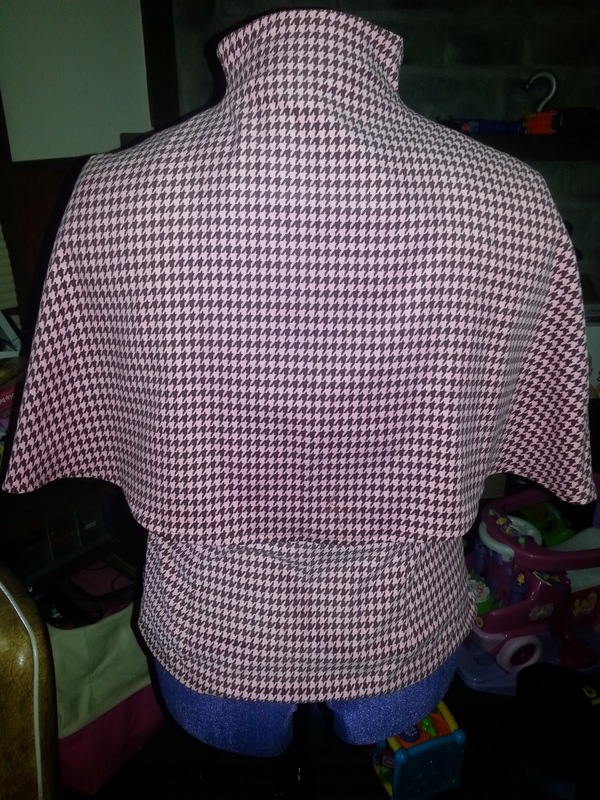 I made a cape last year, but was not quite sold on it, and wanted one with a decent collar, so I modified my original 1950s pattern, drafted a collar and voila! I cape I’m very happy with. 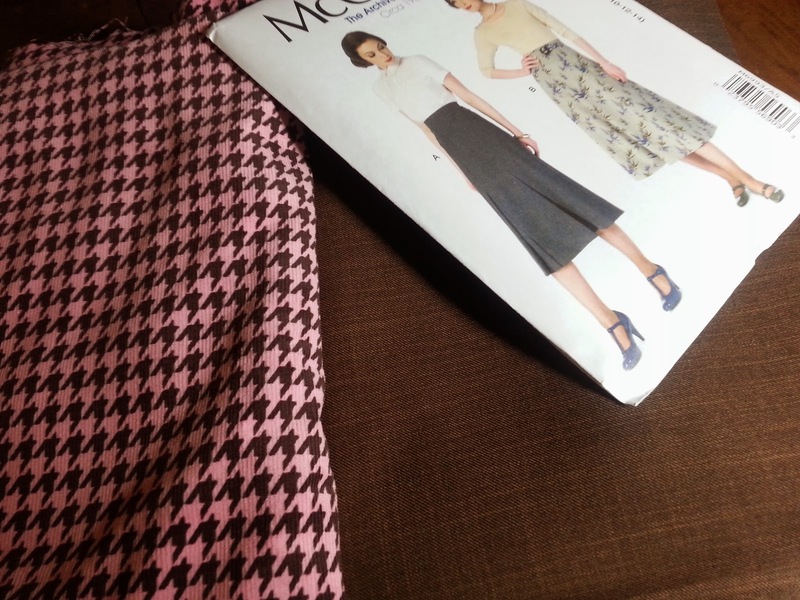 Butterick 6039, my starting point, (the older project is here). 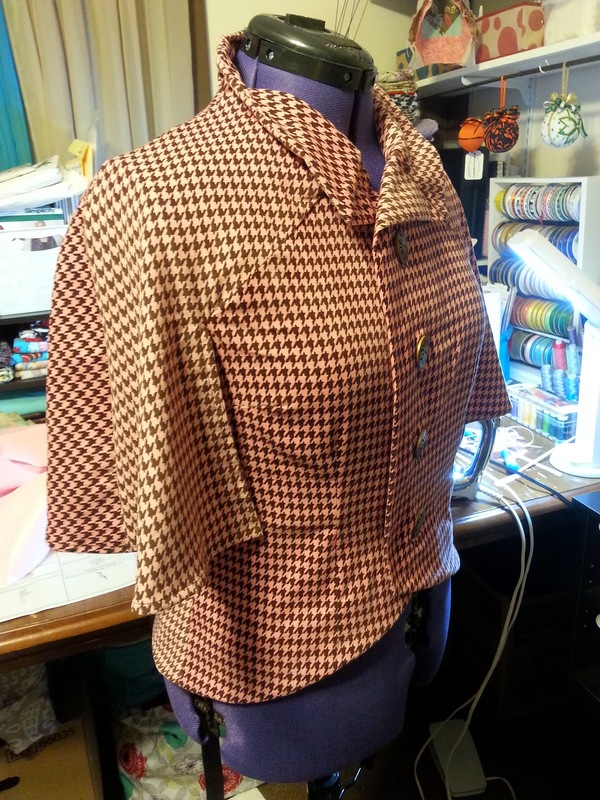 I have more photos and project details on my blog, I used the last of some lovely wool crepe and a remnant of cotton silk for the lining, and a button from my stash. 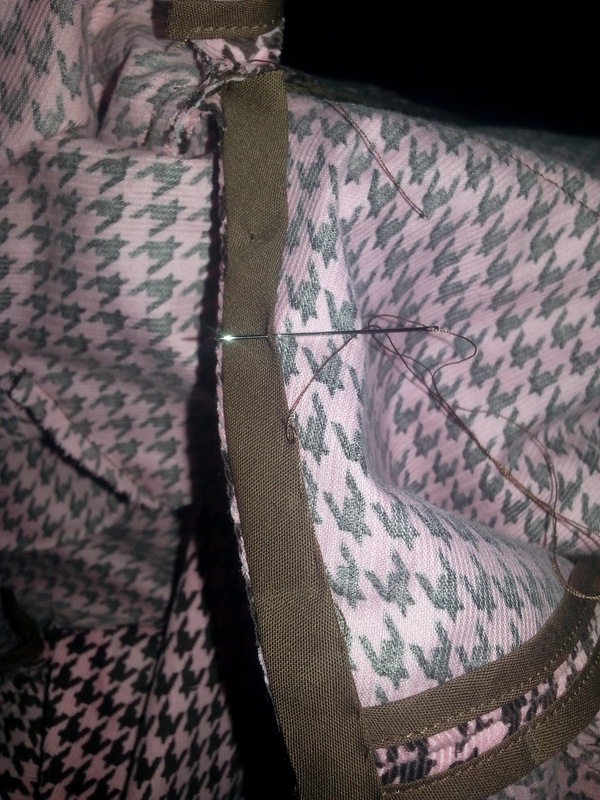 I attached a hook and eye for the closure, sewing the button on top, as I couldn’t commit to it! And I’m still undecided about the best closure. Ha! I’m really happy with this cape, it adds real warmth, without too much weight, it is easy to wear and (I think) it’s a simple way to add some elegance to a more casual ensemble. And it looks great closed or unbuttoned. I just finished up a sew-along collaboration between the lovely Beccie from SewRetroRose and Decades of Style, completing this lovely 1930’s Capelet. Let me just tell you what an amazing project this was. I really feel that this one stretched my limits as a seamstress, and I learned some wonderful new techniques along the way. Before I get to photos of the finished project, let me walk you through the construction. On Beccie’s (SewRetroRose) suggestion I made a muslin for this project. 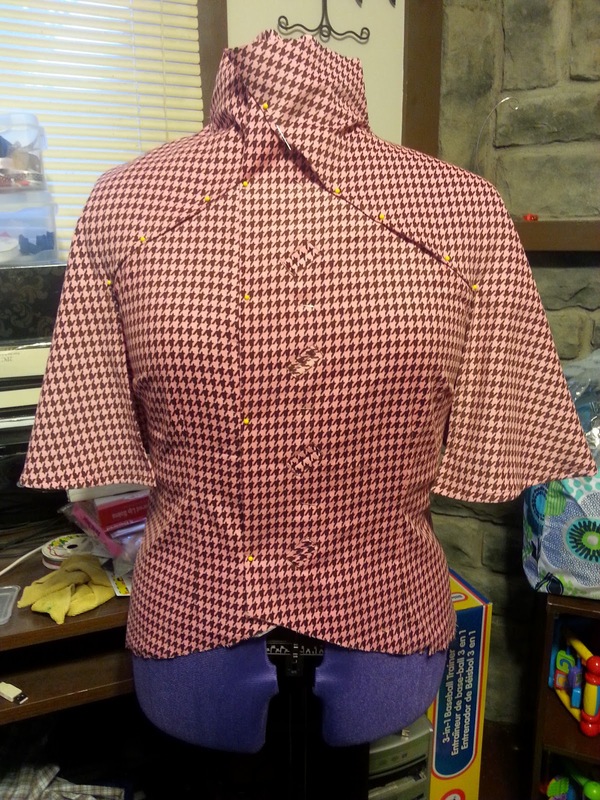 I’m glad I did because while I didn’t need to make any huge changes, I felt much more confident when cutting into my fashion fabric. 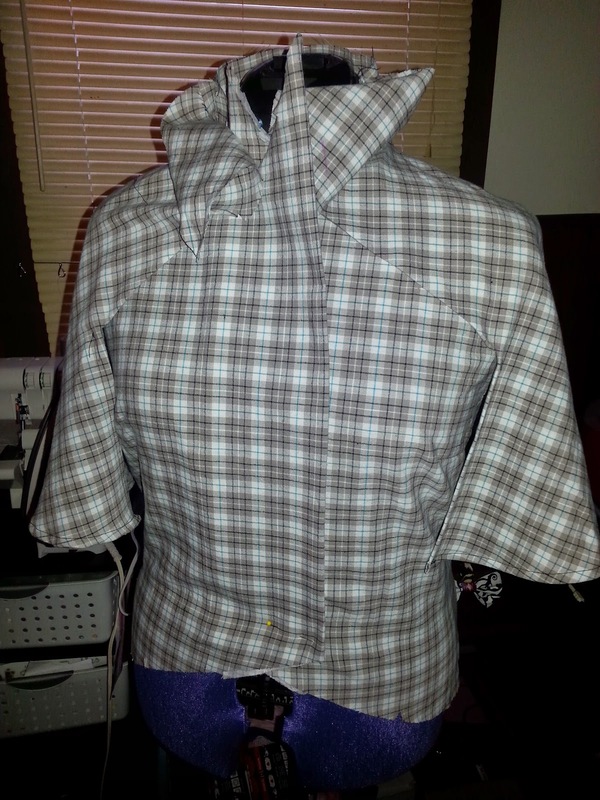 I must admit I do love the plaid fabric I used for the muslin, so this may get finished and be wearable one day. 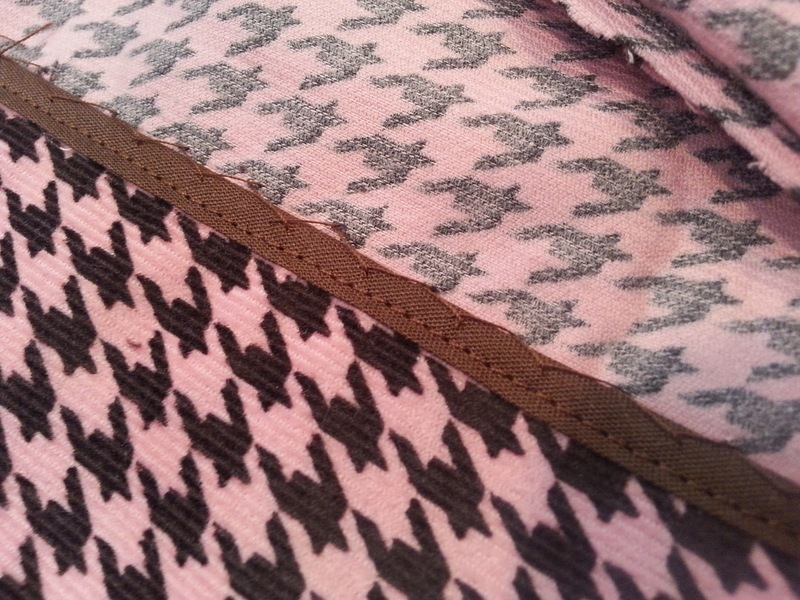 I decided on this lovely light pink and brown houndstooth corduroy that I had about 4 yards of in my fabric stash. I felt that it had the perfect weight and drape for this project. 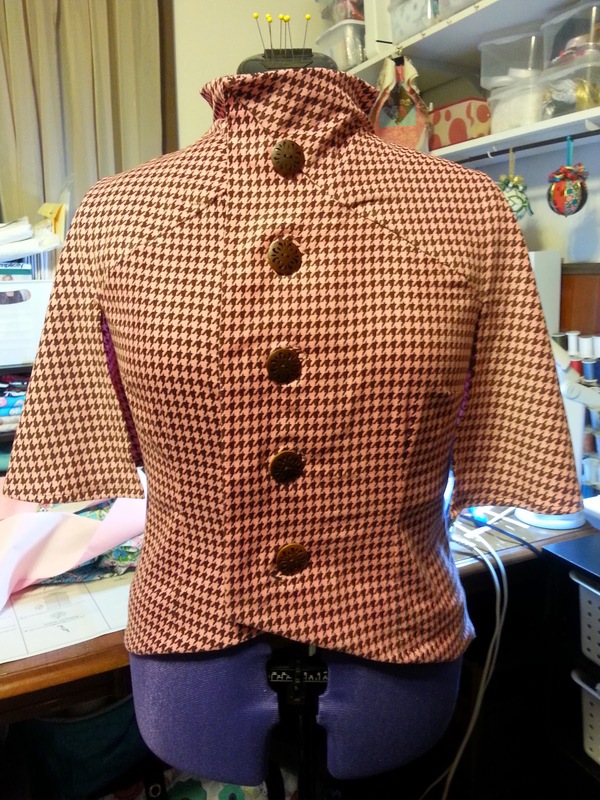 The bodice came together really easily in this project. 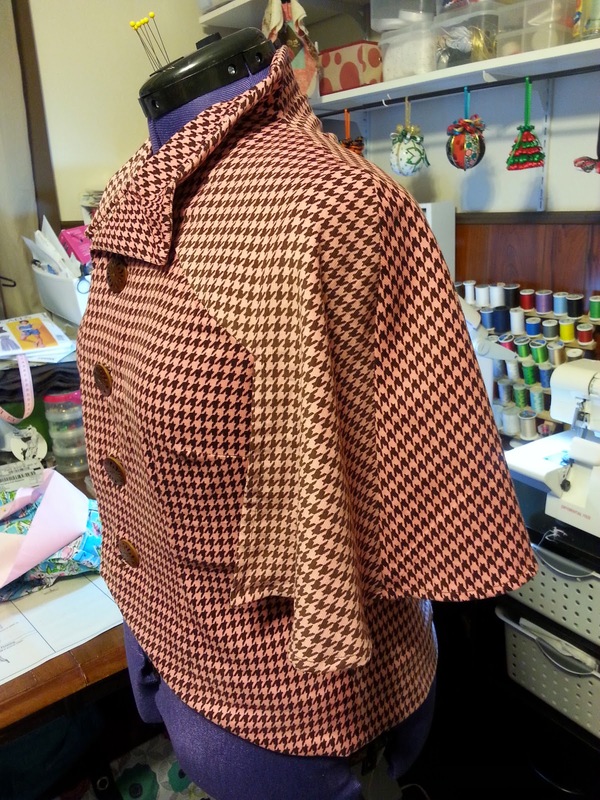 I didn’t add the extra length to the cape as Beccie did with hers, nor did I do a full lining. I wanted to and honestly I bought a lovely chocolate brown satin that was to become the lining, but I chickened out on that at the last minute. Next time I’ll try the lining! I promise! 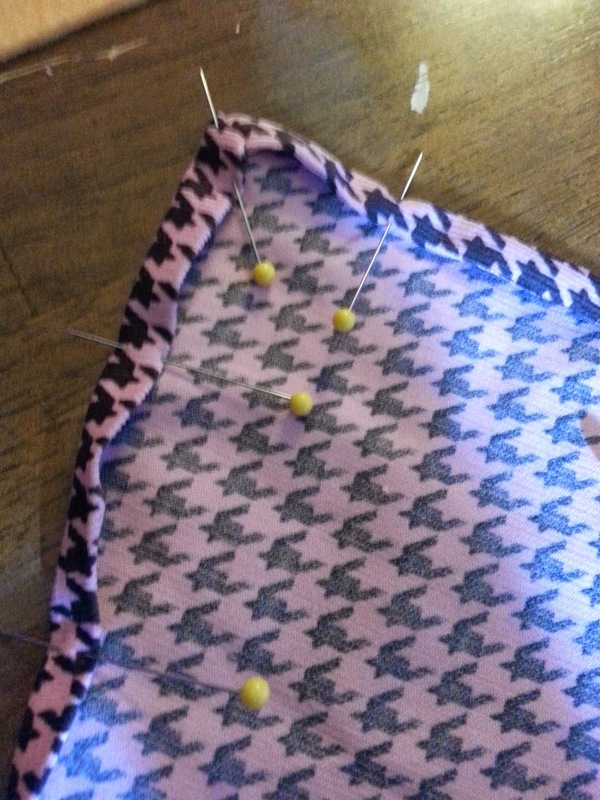 This project was the first time I’d done bound buttonholes. I’m so pleased with how they turned out, even though I ended up with a few minor mistakes, they came together so easily. Next I moved onto the cape itself. This was very easily put together. 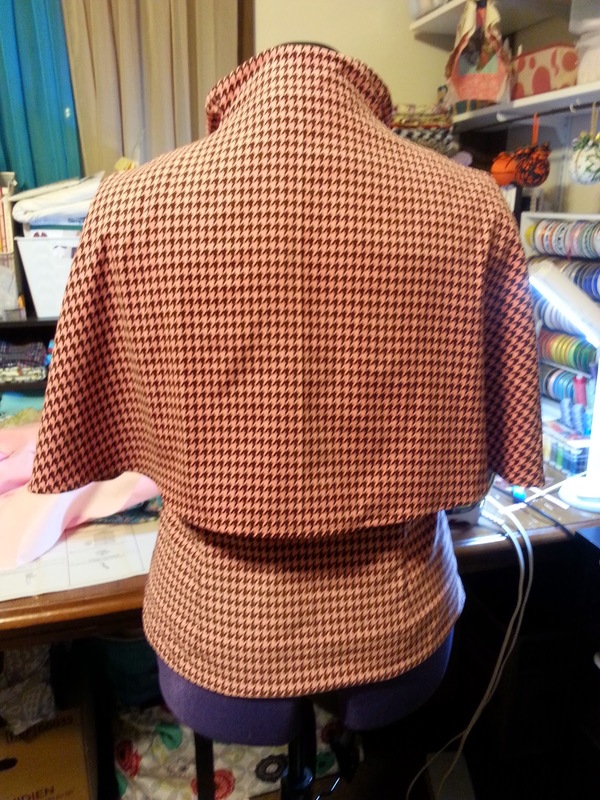 Here is the cape pinned onto the bodice! Thank to my lovely Millie being there for fittings. She’s such a fabulous helper… and so quiet!! And now here it is stitched into place. 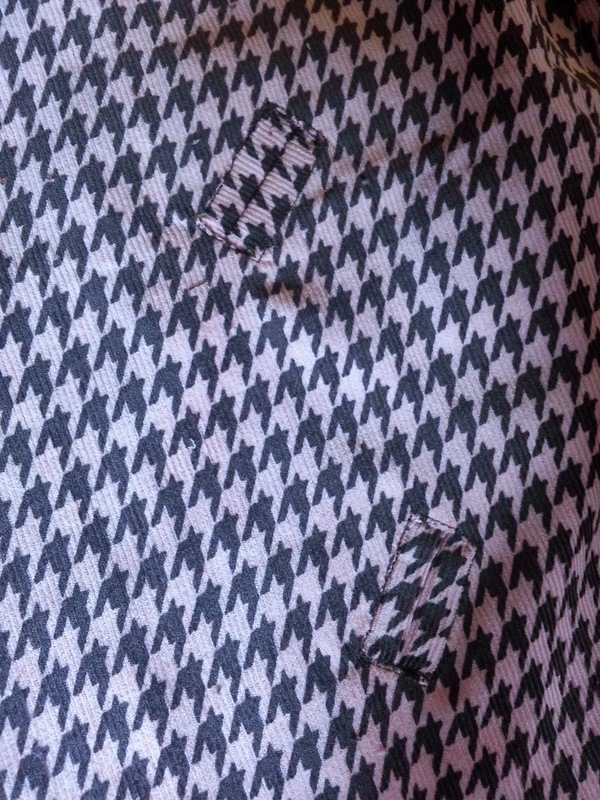 I did have to adjust the stitch line a bit because it didn’t lay just right the first time I sewed it down. 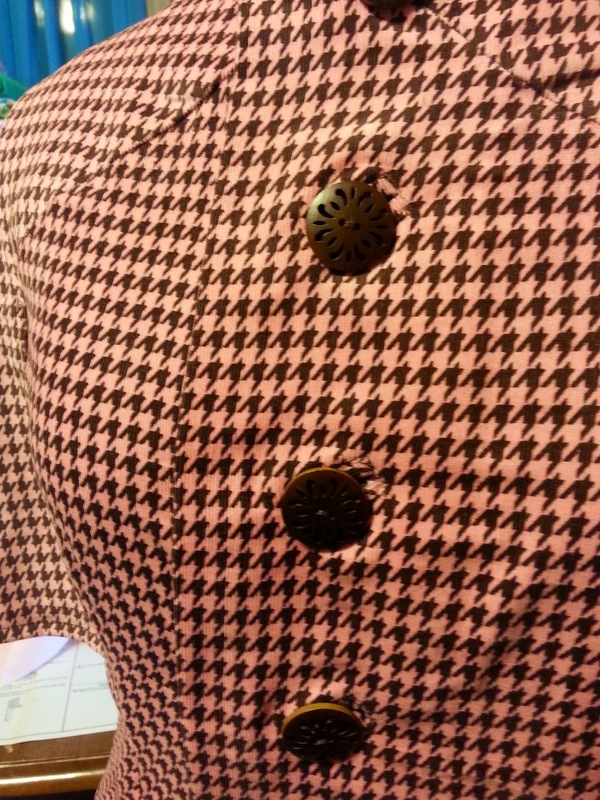 After that it was just a matter of finishing the armholes, adding and tacking the facings and sewing on the buttons. I was so excited to be in the home stretch on this one. 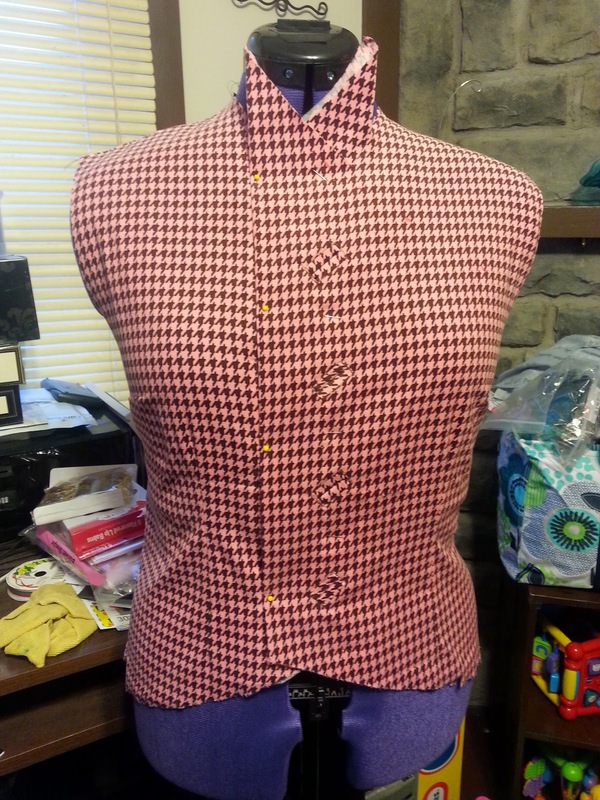 I knew from using Millie that it was going to fit, but I really wanted to see how it looked on me, and that was next to impossible to know for sure without those buttons. I catchstiched all of my facings, which was another first for me. I’ve never used that stitch before. I also bound all of my seams with bias… it’s a slightly different shade of brown that my fabric, but it’s on the inside and no one should notice. I’m sure your all eager to see the finished capelet by now. So thanks for sticking around through this long and picture heavy post! You’re undoubtedly the best readers around! Here she is in all of her glory. 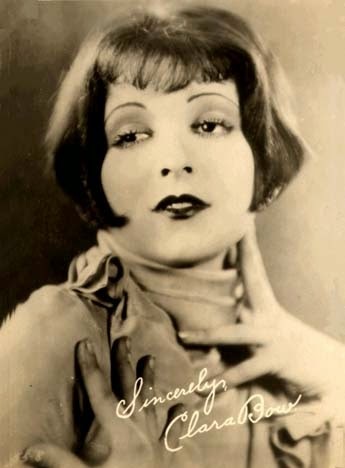 I feel like calling her Clara because I feel like this is something Clara Bow would have worn and loved. It’s just the right amount of glamour and sophistication. 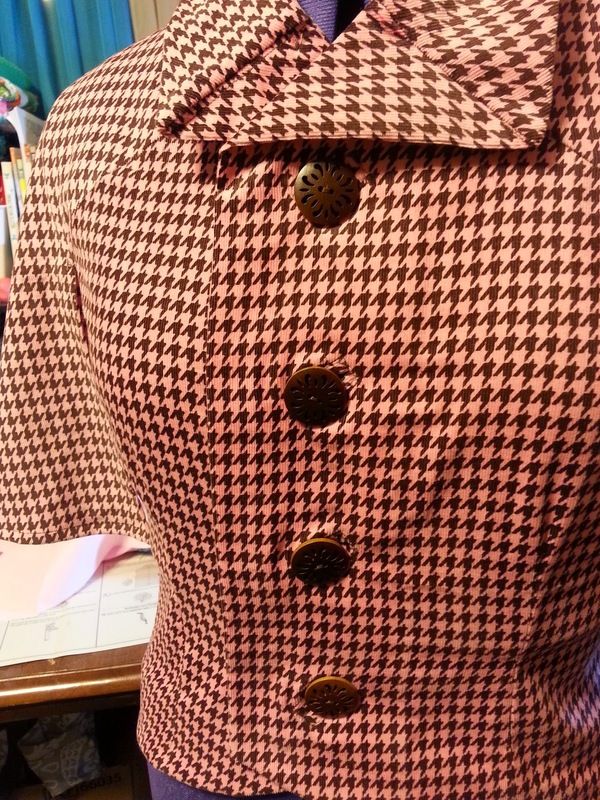 I chose large brown wooden buttons with a filigree pattern jigsawed out of the center. I searched for days for the right buttons and I’m so pleased with these. Look for this make in the near future… but not so near future. I’m leaving on Friday with my two little ones to get on a jet plane and fly home to Sunny Florida!! We’ll be gone for 17 days and it will be a much needed vacation from work and the cold dreary Ohio spring. See you all when I get back! There may be an update or two during the time I’m gone, I am taking my laptop, but there may not be if we get too busy having fun. So don’t despair if you don’t see me. I will be back! Happy New Year to everyone! 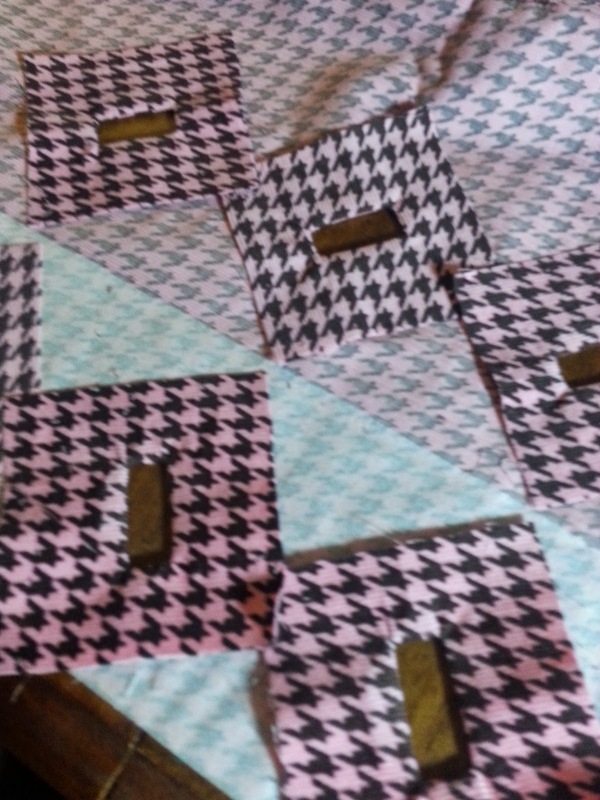 I haven’t been great at blogging this past year, but I’ve certainly been busy sewing. I hope to make it up with posts about most of my 2014 projects in the coming months, I’m looking forward to revisiting them! My latest project was my Christmas dress, another franken-pattern, a mix of several actually, with a vintage feel to it. Overall, though I was pleased with the end result! I was able to wear the dress both to see the Nutcracker (pictured here with a black cropped sweater) and to Midnight mass on Christmas Eve, with the capelet. Many more details and pics on my blog! I made a cape and so far it’s perfect and I love it! I used Vogue 6032 from 1963 and I used a charcoal wool with purple satin lining. It’s fairly warm, except for the no-sleeves bit so it’s perfect for the spring now that it’s starting to warm up. 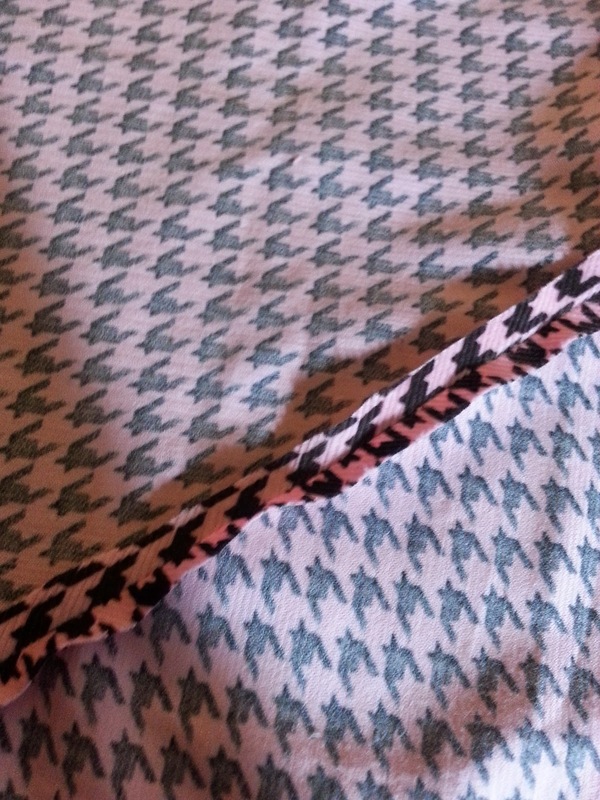 I had a bit of trouble converting all the hand stitching in the pattern instructions to my new serger (as I’m fairly inexperienced with both hand-stitching and serging), but I think it came out really well. It took a bit of practice to get used to walking with my arms out front instead of to the sides, but really it’s like going out with a fashionable blanket on so how can you go wrong?? More construction details and pictures on my blog. You can find a few more pictures are on my blog, Draped in Cloudlets. Hello my fellow vintage sewing enthusiasts! Have you ever had a project that you started and then for some reason put it away for a year? Well, this vintage capelet is one of mine! 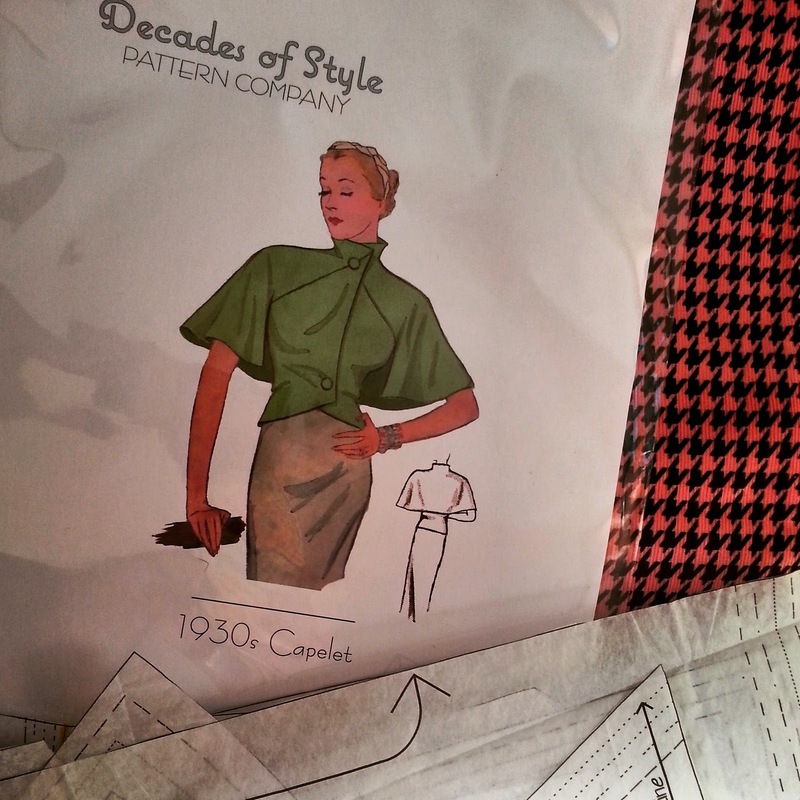 This capelet is made from Vogue 2934, a Vintage Vogue reproduction pattern. I made this in some vintage black rose embossed velveteen that my MIL had in her stash. 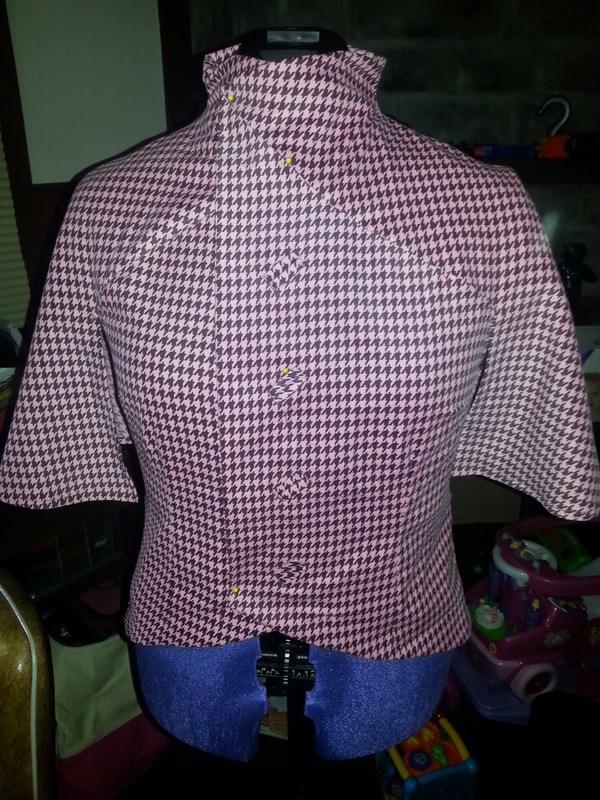 I started making this last year and had planned to wear it on Valentine’s Day 2012, but didn’t get it finished in time and then, of course, I got more interested in other projects and it sat in my unfinished garments box until last month when I took it out because I needed something warm to wear that was fitting to my retro dresses. 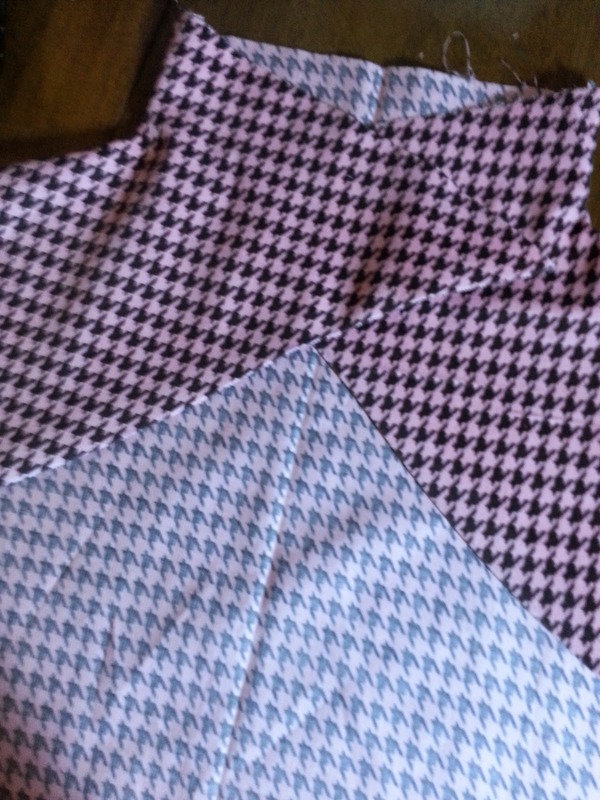 It did not take me long to finish, except for the hand sewing of the lining. 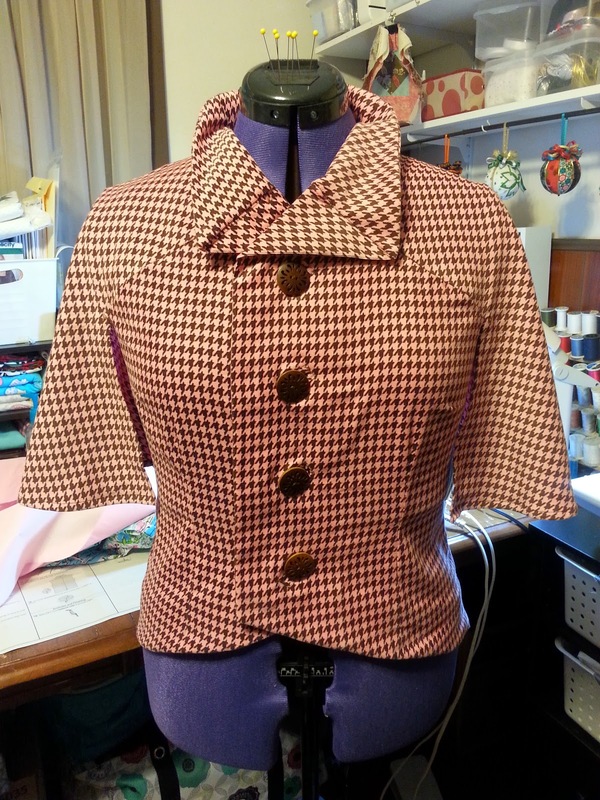 It’s a pretty easy pattern to make with some vintage instructions. I didn’t fold the cuffs and pin them up like the pattern instructed and instead allowed for it to be worn either straight or cuffed.